For many, there’s a new code of conduct while on the annual family vacation: no electronics! If your kids have their noses stuck to their smartphones, iPads or tablets, they will miss the world around them, and you’ll lose out on valuable family bonding time, which is usually the point of the vacation in the first place. It can be advantageous to bend this rule during the trip to and from your destination, however, and here are three reasons why you should still take your electronics with you when you travel. It does not matter if you travel by train, plane, or automobile; your children will become bored quickly. The excitement of traveling to the fun destination will wear off as the minutes tick by and the inevitable and repetitive “Are we there yet?” is enough to drive any parent to the brink of insanity. No matter how many times you tell your kids it will be X hours until you arrive at your destination, they will ask the question again. When it comes to relaxing and unwinding after school, both of my boys love spending an hour or so playing video games. And while I don’t mind that, I do prefer that they do something to enrich their minds if possible…as long as they’re still having fun, that is! So when I learned about Safari Tales, an iOS, Android and Amazon app from Kuato Studios that combines engaging gameplay with literacy skills, I couldn’t wait to see what it was like. The fact that this game, created by the same developers as the award-winning Dino Tales app, featured baby animals was something I especially loved. My youngest son adores animals, so a game that let him play and interact with a baby lion, elephant or giraffe was something that I knew he would enjoy. I downloaded the app on my iPad, entered Benjamin’s name and reading age and let my son sit down to play. I’m very picky when it comes to buying expensive new gadgets and tech toys. For me, they’re rare purchases meant to be taken care of to ensure their longevity. The iPad Air is one of the most coveted gadgets around, so when I was given one, for a while I didn’t dare open the box for fear an errant scratch might blemish its fine finish. Happily I was given the chance to review the Snugg iPad Air Case Cover with built-in flip stand. Available in 14 different colours, including a unique denim finish, there is sure to be a shade to match your tastes. If you love solitaire, you’ll love the latest release from Big Fish Games available today for iOS and Android devices! Fairway Solitaire Blast, the sister game to the hugely popular Fairway Solitaire, takes the ever-popular game of solitaire to a new level with fun animation, cool power-ups, bright colours and a gameplay style that’s appropriate for all ages! The goal is to clear the cards off the board. The twist is that you get to use an array of power-ups to help you beat challenges that are designed around hand-crafted card layouts. All played on golf courses that include hazards like crab grass and sand traps. Altogether, you’ve got a unique solitaire puzzle game that earned the franchise IGN’s Fan Favorite Mobile App and Mobile Game of the Year nominations in 2013. Devise your strategy then attack the course! If there’s one thing I love, it’s a good debate but to really develop an interesting conversation, a great topic is essential. As a mother, I have a lot of opinions when it comes to parenting and recently I learned about a fun new debate and discussion site that’s full of great topics called Discuss. Essentially, users can post a 100-character statement and then other contributors chime in with their opinions. What I love about this site is how many different topics it covers, and when this statement caught my eye, I couldn’t help but think about all the possible responses: Kids shouldn’t learn to use tech before they can read. Initially, I have to admit that I leaned towards agreeing with this statement. After all, the Canadian Pediatric Society recommends that children under two have no screen time at all and that those between two and four years of age have no more than an hour of screen time. In fact, the studies of Dr. Gary Small, Director of the UCLA Memory and Aging Research Center, show how children’s brains today, specifically the frontal lobe, are developing differently than their parents’ due to technology exposure. Welcome to the iPad Mini Back to School Giveaway hosted by This Lil Piglet, Sober Julie and Simply Stacie, along with several other bloggers who made this giveaway possible! 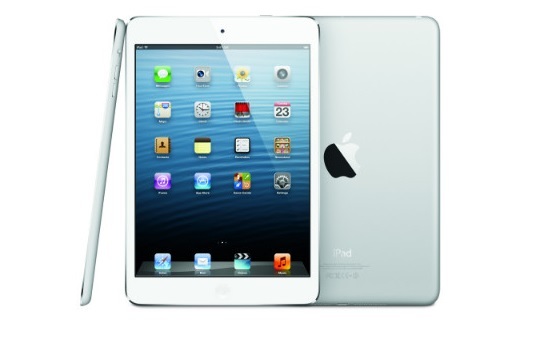 One lucky reader will win a 16GB iPad Mini valued at $329. 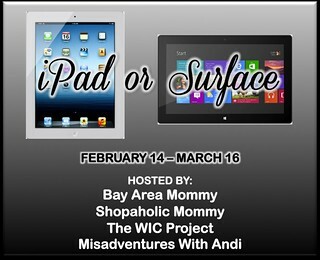 Welcome to the February iPad/Surface Giveaway! An awesome group of bloggers have teamed up to bring you this equally awesome giveaway for an iPad (ARV: $499) or a Microsoft Surface Tablet (ARV: $499)! Winner’s choice!